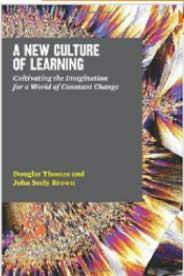 I reported a few days ago on a conversation with the authors, Douglas Thomas and John Seely Brown, of the wonderful new book, A New Culture of Learning: Cultivating the Imagination for a World of Constant Change . “The Montessori method cares far more about the inquiry process and less about the results of those inquiries, believing that children will eventually master–with the guidance of their teachers and the engaged use of the hands-on Montessori materials which control for error–the expected answers and results that are the focus of most traditional classroom activity. “My daughter’s lower elementary teacher (Montessori classes are typically multi-age, lower elementary is grades 1-3 together) recently told me that a few kids in her classroom were learning about the triangle and they asked “Can a triangle have more or less than 180 degrees?” In classic Montessori style, the teacher turned the question back on them and said, “Use the hands-on geometric materials and try and make an actual triangle that is more or less than 180 degrees.” So the children have their question honored and arrive at the proper answer by themselves. As I am sure you have heard many times – your post is a great post. Directionally speaking the Montessori approach is highly aligned to much of our thinking.. with our focus being more on scale and scope.. how might one build an entire educational system – not just k-12 or k-16 but a true arc of life scope that leverages the naturally occurring resources of collectives, the tools of social media with an explicit amplification of mentoring, reverse mentoring (and peer to peer mentoring) with explicit focus on cultivating imagination, not just creativity. We also wanted to problematize experiential learning, and the roles of indwelling/collective indwelling in order to provide a better foundation of entrepreneurial learning. As such, personally speaking, I have always been inspired by both the Montessori methods and much of Piaget’s early work on assimilation and accommodation. But our goal was not to write an academic thesis – although that is our natural tendency – but to hopefully start a discussion around a new kind of learning platform that honors the past but scales to a new kind of future. Larry Page is a Montessori alumnus! Thanks for the interview, it's been very interestingly.